While we are still in that daze of those days between Christmas and New Year I thought I would share three of my favourite reads of 2018. I first started reading the books of Matt Haig last year – and his festive novels were my starting point. Therefore, when I spotted ‘Father Christmas and Me’ in paperback this festive season, I had to read it. This was a lovely third festive novel. It dealt beautifully with the theme of difference and the uncertainty that many (especially the young) feel about trying to fit in. The clash of the Easter Bunny and his team wanting to ruin Christmas gives Amelia (our young heroine) to not only save Christmas, but also cement her place in Elfhelm. I enjoyed the humour in the novel and, although it is part of a series, it can be a standalone novel. Enjoyable all the way through. The lovely Miss W gave me ‘One Day in December’ as a Christmas gift. I was so excited, as I had spotted this novel all over the Bookstagram world. This is a lovely read – a modern romcom. Girl almost meets boy, but girl and boy become friends and life starts to happen to them both, but not quite in the way either hopes. I can not spoil this book for anyone who would like to read it, however I have to issue a mascara warning – for tears of sadness and tears of joy. I am a huge fan of ‘A Christmas Carol’; it is a story that always guaranteed to evoke a festive mood. I am also a fan of those authors who have the guts to take on the stories of some of our most established classic characters. I saw an article that talked about how Sarah Marshall had to complete Vanessa Lafaye’s work, as she died before she was able to. This made me even more intrigued to read this book because they clearly had both a great friendship and a deep appreciation of Dickens’ work. It is clever that it is told from the point of view of Jacob Marley’s sister. It offers us the tale of her and her brother and, and why Marley becomes the ghost we all know so well. It is a tale that provides us with some answers/predictions to the background of the famous characters. I really enjoyed this book and may need to make this as much of a tradition as the original ‘A Christmas Carol’. Do you have any favourite festive reads I should plan for next year? Reading a novel by Agatha Christie at this time of year is like a hug. Although this is not a festive read, it has been selected by ‘The Maidens of Murder’, as the BBC has an adaptation of this classic in its festive TV schedules. I found this to be one of Christie’s most clever tales. You really do fall for the huge red herring that is marked for you from the start – even though you know you probably should not. Our murderer really does go out of their way to try and get away with murder. Of course, you know that Poirot will always get his target. However, this also reminded me of Sherlock and his foe Moriarty, as this is more of a case of puppet and a puppet master as many of their classic encounters can be. As a bold statement, I think this could be one of Poirot’s most wonderful cases – especially as the big reveal was as much of a surprise to me as the characters in the room with man himself. I would like to thank ‘The Maidens of Murder’ for encouraging me to read of a scope of Christie’s work – I look forward to more in 2019! I am about to make a bold statement: this is my favourite Pratchett ever (so far – as I am reading them in order). I was late to discovering Pratchett. 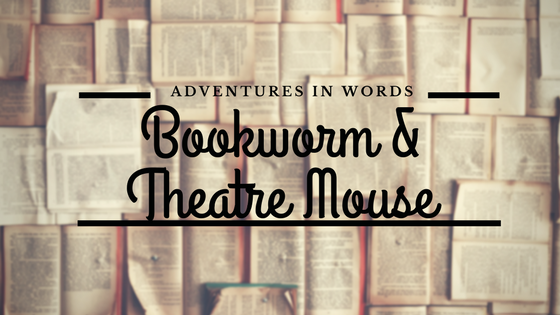 Mr Bookwormandtheatremouse is a big fan so I decided I should give the Discworld novels a go, especially once the beautiful hardback books were published. I have to admit that sometimes I am not entirely sure what has happened in the stories but I have always enjoyed them. However, ‘Pyramids’ seems to have changed that. I managed to keep the thread of the story even without chapters (that has really taken some getting used to). ‘Pyramids’ is infused with Pratchett’s gentle humour and witty observations that create his Discworld parallels to our world. Their version of Ancient Egypt is highly ridiculous with a whole host of highly comical and equally ridiculous characters. Yet, the odd voice of reason comes in the shape of our hero, Teppic, his ghostly father and a camel (well, he offers thoughts of reason). This book has certainly reignited my joy in being part of Discworld. I accept that chapters are not a thing and sometimes I will need a character list to keep me on track, but the escapism is totally worth it (and the giggles). The Bookstagram community has been one of the best spaces I have found. It has brought together so many fabulous bookish people and it has encouraged me to read all sorts of books that I may not have read or have had on the to-be-read pile for a while. My latest read-along (that I actually managed to complete and stick to) was ‘The Moonstone’, as part of the ‘Victorian Sensation Book Club’. This has been a lovely community where, in the month of November, we read a section a week shared our thoughts. There have been great discussions and such a friendly atmosphere (and the end of November does not mean that the chatting stops). And, now to the novel, my only regret has been that I did not read this sooner. ‘The Moonstone’ is a story I have known for a long time thanks to TV and Radio adaptations, but I had never got round to picking the book up. What wasted time that was because I absolutely loved this! From the moment I started this book I could not put it down. Collins created a wonderful detective story (some say the first modern one in fact) from the word go. You are drawn into the narrative by how ‘The Moonstone’ ended up leaving India and arriving in England. Even that simple introduction is shrouded in mystery just as the rest of the tale is. Collins creates a colourful cast of characters who become mixed up in the mystery of ‘The Moonstone’. However, together, they eventually also manage to solve the mystery of this magnificent stone. This is a tale that has stood the test of time as it can still engage modern audiences. However, it is also a novel of its time with references specific to the period but all of that is the context of the era. Reading ‘The Moonstone’ has firmly cemented Wilkie Collins in the territory of one of my favourite authors of the classics. I can not wait for the next read with the ‘Victorian Sensation Book Club’, which is ‘The Woman in White’ in January. However, I was left a little deflated when I started. The pace of the novel was slow – and I think I had been so spoiled from being familiar with the story that I wanted action to happen almost immediately. This is not a bad novel at all, I just found it a struggle to get into. Although, once we did reach a little bit more of the action and the tension began to build, I found myself more engrossed. There was possibly a little too much scene-setting, as a cold case rather than a current investigation is the main focus. There is, however, all the way through, the charm we are all used to when we join a Miss Marple investigation. There is great characterisation as Miss Marple meets her cast of characters on her coach holiday paid for by her ‘Nemesis’ – our dear friend Mr Rafiel. Yet the one big question I had by the end (other than why the ITV versions always strayed from the novels) is why, in the TV adaptations, does she always take a nephew with her on this trip – when, in the novel, she is such a tough, independent lady? Let’s give Miss Marple all the credit she deserves. 2018 has been a funny old year so far, but one constant has been my enjoyment of books by Matt Haig, both fictional and factual. I did, in fact, read his Children’s Christmas fiction first and was intrigued when this year he released his first Children’s book that really tackled those issues he can be so outspoken about on social media. Although ‘The Truth Pixie’ is a Children’s book it is a book, I think everyone should read it. The Truth Pixie is a little bit of an unhappy soul at the start of the book. However, her chance encounter with a little girl who is finding things tough helps them both find some happiness. In fact, the truth our pixie friends speaks is a truth about life that we should all try to learn from. This book, for me, was not only a beautiful read from cover to cover, with great illustrations from Chris Mould, but will also be a little reference guide. You can turn to a number of pages and you will find a spark of inspiration or motivation for any number of difficult situations. So, I urge adults and children alike to read this book – or why not read it together? After all, most of my fondest memories with those I love are of when we shared a book together! So, I spotted that this was considered a must-read for autumn, which was the final little piece of encouragement I needed to pick up a copy – as, basically, I wanted to read it anyway – haha! This is a brilliant thriller and I was genuinely surprised it was a debut novel. It is a clever and sophisticated plot with a twist on what seemed like every page. The tale is told in the past as well as the present – giving us the context around the strange events playing out, or almost, repeated in Eddie’s life. I genuinely can not say much about this book but I do not want to even hint at a spoiler for anyone who would want to pick it up. However, I would have liked a little bit more of the ‘spooky’ side of the tale – but this does not negatively impact the tale at all merely a personal preference. I also could not believe the final chapter – it was not what I was expecting at all – maybe some of you would have spotted it, but I didn’t, so it was an excellent twist. The Chalk Man – which works on more than one level in the story – is correctly identified as an excellent autumn/winter read. It is ideal for those dark nights when many of us like to be a little bit spooked. I had spotted this book in the Bookstagram world, so when it was a bargain then I had to pick up a copy. Now, I had no idea what this novel was about, just that it was by the same author as ‘Gone Girl’. When I started reading I was instantly hooked as there were so many strands to this novel that you simply wanted to know ‘Who, What, Where, When, Why, How’. There is a clever study of human nature and psychological throughout. The interactions between the characters are absolutely fascinating. Especially, when you realise the impact that someone’s actions and attitudes can have on someone else. Camille and her mother have a very strange and strained relationship but as secrets are uncovered there are even more surprises ahead for all. As well as the solution to the mystery gripping Wind Gap. This book is not a comfortable read, as it deals with some very difficult issues, but it is compelling. I am glad I have read it and it will certainly stay with me for a long time to come – a good autumnal choice. Have you read any Gillian Flynn novels?